Today I will be looking at the Trustfire T2 click for product page $22.33 posted to your door at time of review . can I say Monolithic . And I mean that in the best possible way . and I mean intense , it really gives a good XR-E a run for its money . lights have been of the tail clicky design , so the T2 is departing from the norm . to click the switch at all , as it will change modes before that . modes , it just feels and operates with ease , no fumbling around with this one . The threads are very well machined and smooth ..
Wow , just look at how neat that is ..
into all its production lights , because this was impressive . A full 10 out of 10 for build quality on this one . The T2 is 4.2v and was built to run the 18650 , so let's take a look at how the T2 performs . Now I did mention this light throws , 9800Lux @ 1meter is right up there with my best stock P60 equipped with a XR-E emitter , this thing really throws . is concentrated in the hotspot , the T2 is seriously well focused . upon the reader , that the T2 takes Trustfire to a new level . just dont want to be , and this light has found a place in my collection ..
just the bees knees . Trustfire can not only maintain the quality of the T2 , but also bring all there other products to this level . I can see where this would be more of a plus than a minus . Thank you Manafont for sending me the Trustfire T2 to review . Even on the head , looks like there is room for a second O ring , should you want to double up .. Designed to be ? Single or double ? I've ways liked the look of that torch. A real classy act! One day I'll get one but will be certainly upgrading the driver. I don't really understand the thinking of putting modes at 100%>95%>90%>Strobe>SOS. Joking aside, I only see a slight difference between high & low in the photos and none between high and medium. The camera has problems , as it adjusts to the amount of light [ Full auto point and shoot ] , so it becomes difficult to show the real difference in output . With a XM-L , medium actually looks brighter than high , because High has so much output the camera increases shutter speed to compensate and due to the amount of light , over compensates . Looking good Matt, thanks a lot for the comprehensive review! Frontpage'd and Sticky'd. High in the picture , is about what low looks like to the naked eye , actually it doesn't make it . Low to the naked eye is brighter . It would be nice to capture a true = to the naked eye , image . I hope this clears up any mis-understandings . whats the purpose of that thread on the rear of the light ? Yes = It is a tripod mount , fits my camera tripod no worries . Isn't this light the one Trooplewis has been saying is his favorite ? Great review as usual old! Damn you OLD. I just had to get one. Absolutely. I've had mine for about 2 months, and love it. Especially the side clicky, and the stainless end pieces. Very classy looking light, easy to pocket, natural to hold. Even though it throws well, there is a lot of spill with it too. Old , or anyone that knows , is the pill solid or hollow under that black disc ? I'm still waiting for mine. It had better come tomorrow! EDC, did you ever get your T2? What do you think of it? 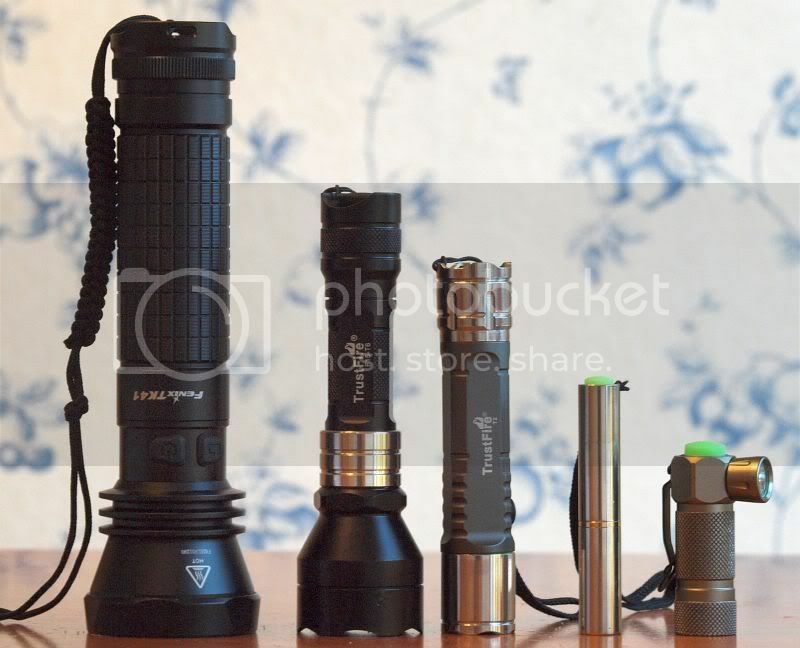 I bought this flashlight and it's pretty nice, I just wanted to know if I need protected cells for this because I have a bunch of salvagaed laptop cells in good shape, does the lamp come with protection circuit? you should'nt need protected cells for this light, all my 18650s are from batt packs. being a single cell light, should be safe. good if you had a voltmeter to be on the safe side. Thank you, I just put a cell on it and will leave it on until it goes off and then check the cell voltage to see how low did it go. You're welcome,just make sure it does'nt get too hot. If anyone with this light gets a chance, could you measure the diameter of the driver and the emitter star? I've got one on order from Manafont and would like to replace the emitter with an XM-L and the driver with an 8x7135. Oh man, this light is so interesting. The biggest drawback is the low mode is way too high. I'd love a BLF version of this light. Kill the flashy modes, make the mode levels useful that includes a moonlight mode, anodize the tailcap threads so it can be locked out, and update the LED. Gords modded his, but don't recall what he did exactly - it's beggin for an XP-G2 at the least, preferably on the new 16mm SinkPAD coming (think it's 16mm or maybe 14mm)... I got a T2, just didn't get around to look'n into it yet. Hi, I added an xp-g r5 4c and a 1.7a nanjg. You need to use a 1 sided driver due to the set up and a 16mm star. A neutral white sinkpad xp-g2 @ 2.5 amp would be awesome but would get hot real fast, it heats up at 1.7a tbh. That said, I love this little light, its not brilliant in a trouser pocket due to no tailcap. lock out but I easily forgive its faults just looking at how pretty it is.